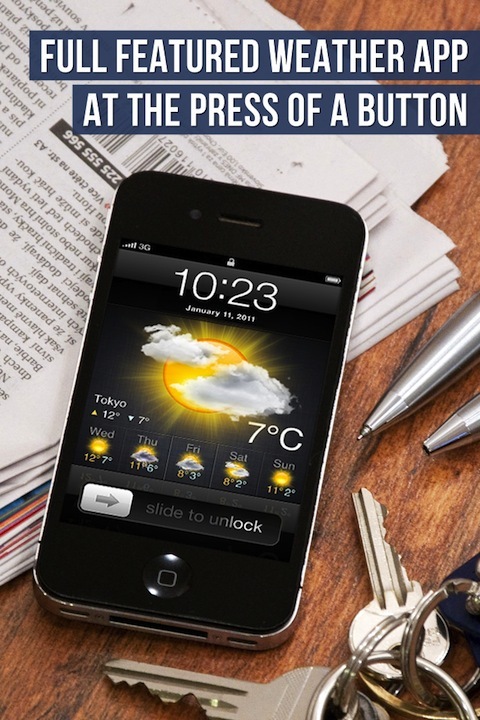 Lock Screen Weather is a brand new iPhone app in the App Store that puts weather information on the lock screen on your iPhone or iPod touch. The good news is that this app does not require you to jailbreak your iPhone but you do need to be running iOS 5 to use it. The bad news is that for now it causes a pretty massive overheating issue when you run the app. You’ve been warned, so if you still want to give it a shot, read on. Once you open the app all you have to do is choose from a few simple options and you’re done. You can enable or disable the app, show/hide a 5 day forecast, change from Fahrenheit to Celsius, and choose what if any background sound you want playing while the app is running. Then you can hit the home button on your iPhone, and or the lock screen button on top of the iPhone. Amazingly you’ll see a beautiful graphical weather information for your city along with a 5 day forecast if you chose that option. You may also choose a different city from the app’s settings. Lock Screen Weather uses the area under the clock and above the “slide to unlock” bar to display its information. The data is updated automatically every few minutes, but the app doesn’t really tell you when the data was last updated, or how often exactly. The graphics are amazing and super sharp and professional which is a huge plus, compared to the couple of other apps in the App Store that do the same thing. You can’t interact with the weather info at all, just view it. The icon shows a large graphic for today with the current temperature using the same font used for the Clock on top, which makes the entire screen look very professional and uniform. You also see lows and highs. There is also a 5 day forecast option which includes today, so you really get a 4 day forecast. The app must keep running in the background at all times for the lock screen weather data to be displayed. If you force quit Lock Screen Weather, you lose the functionality. For now, there is a noticeable issue that causes the iPhone to overheat and possible drain its battery. Let’s hope this is something that the developer can fix in the next revision. There is an option to play some nature sounds in the background while you run the app, which could appeal to some users, although I chose to silence this option as it became pretty annoying after a few minutes. There are 4 sounds included: Meadow, Jungle, Lake, and Ocean. 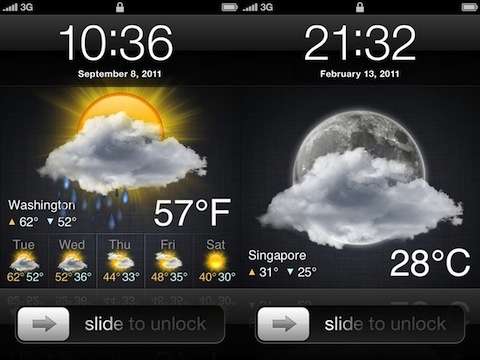 AppSafari review of Lock Screen Weather was written by Joe Seifi on December 30th, 2011 and categorized under App Store, Weather. Page viewed 8071 times, 1 so far today. Need help on using these apps? Please read the Help Page. This app is total junk. My iPhone 4s with iOS 5.0.1 would not go to sleep with the app installed. It has many problems. Save your $.99.